It is Blog Appetit's particular brand of bait and switch to call the time I spent with Clotilde Dusoulier of Chocolate and Zucchini cookbook and website fame "my evening" unless your definition of a private tete a tete includes a packed room full of fans, a brief encounter involving signing a book and the opportunity to ask a few questions. Clotilde was sweet, disarming and charming. Her English is mostly unaccented except when a little musical lilt slips out on a word or two that is similar in English and French. Dressed in a long polka-dotted tunic over pants and with her long hair swinging loose, she seemed too young to be allowed to handle hot pots unattended. 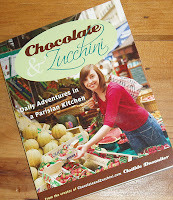 She was as gracious to her fans, loyal to her vision and as appreciative of the twists and turns of life and her upbringing that brought her to C&Z and food as a career as she seems in her writings on the website and in her book: Chocolate & Zucchini: Daily Adventures in a Parisian Kitchen. Here are some highlights of her conversation with her fans at the booksigning. She is working on her second book, also for Broadway Books, her cookbook publisher, on food resources and restaurants in Paris. She spent summers in England living with families to perfect her English as a teen. As a young adult she worked in Silicon Valley as a software engineer, a career she doesn't regret pursuing but has left to work full time on food endeavors. Her sojourn in California had awakened her appreciation of food and moving back to Paris was a revelation. 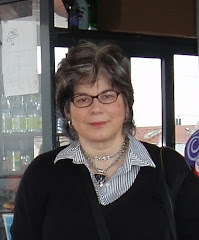 She was inspired to start Chocolate and Zucchini after reading food blogs such as Derrick Schneider's Obsession with Food. There were only a handful of food blogs at the time and they were all in English, so she wrote in English because she wanted other food bloggers to be able to read about her experiences. She took all the photos of Paris and recipes that are in the book, with the exception of one taken by her boyfriend, Maxence. The cookbook is being translated into French, but since her audience is so English speaking she is not sure what it is reception will be in France. Clotilde translated everything but the recipes, which are being done by someone else because of time consideration. She wanted to translate the narrative personally since she wanted to adapt the text to a French audience that would presumably be more knowledgeable about things such as cheese courses. She also insisted that the publishers not use a photo of her on the cover of the French edition since that is not done as frequently in France as in the U.S.
She finds her inspiration in the green markets and other food shops in Paris and looks for interesting juxtapositions of taste, texture and color. She misses the larger markets in the U.S. where one can just browse instead of walking in and having to know what you want right away. True Confession: I helped test recipes for the cookbook and merited a mention as a thank you in the book's acknowledgement. Next: I read the cookbook, try a recipe and offer my impressions. I'd love to take full credit for inspiring Clotilde, but I have to share it with Julie Powell, Josh Friedland, and I think one other. This is from my distant memory of an interview she gave, so I could be wrong. I'll edit the post to make you "one" of her influences, but I'm sure you were an important one!